On thiruvadirai star of Margazhi month, Kali and ezhu kari kootu is made and offered to the Lord and consumed as prasadam. Wash the rice, drain water completely, pat it dry with a clean towel.Heat a pan and dry roast rice until golden brown. Keep aside. In the same pan dry roast moong dhal until golden brown. When cool, pound rice and dhal in a mixie to rava consistency. Crush jaggery. Heat a pan, add little water and add the jaggery. When it dissolves, strain and remove the impurities. Pour it in the same pan. When it boils add a teaspoon of ghee. Now add the rice, dhal mixture and stir well without any lumps. Add scraped coconut, cardamom powder and the remaining ghee. Mix well and pressure cook for 3 whistles. Alternatively, you can cook it covered in the pan itself, in low flame, stirring frequently. 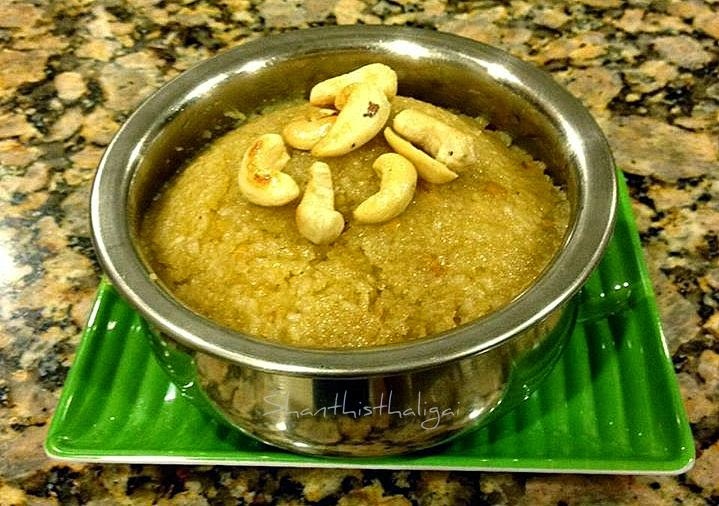 When done, add ghee fried cashews, mix well and offer it to the Lord alongwith Ezhu Kari Koottu (Thalagam). Variations: Dhal can be cooked separately like sundal consistency (not mushy) and added.